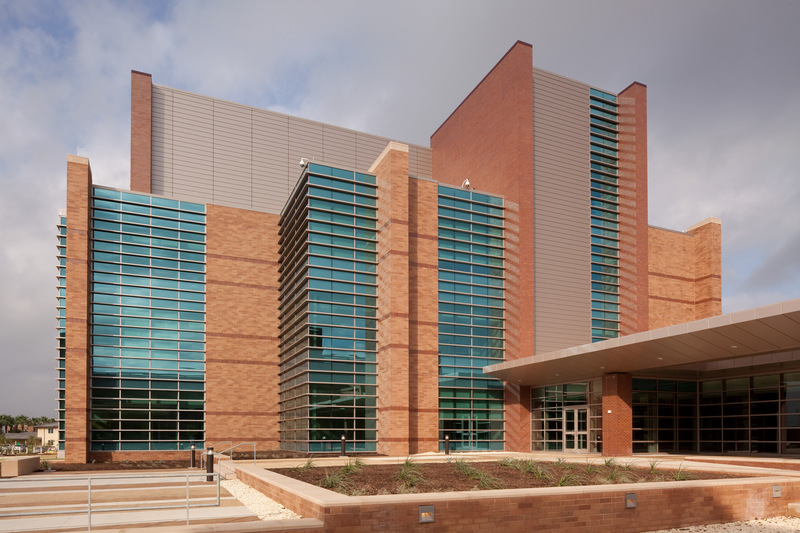 The Battlefield Health and Trauma Center, a new casualty care and research facility at Fort Sam Houston, Texas consolidates clinical care with research and development activity to provide one multi-disciplinary center for combat care.The BHT Center is a new high-tech and high-profile facility that integrates research for each branch of the armed services (Army, Navy and Air Force). 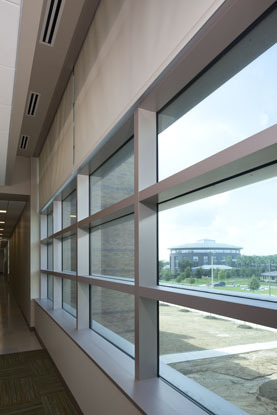 The facility's mission is to provide the most innovative medical technologies in one research center and clinical foundation. 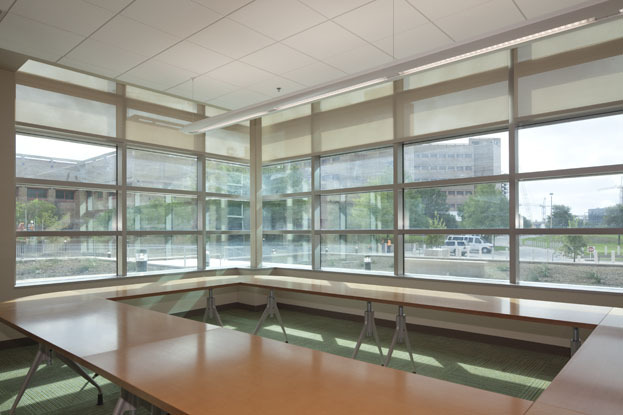 Populous, the architectural team in charge of the project design, took on the challenge of developing a sustainable facility and finding a window shading solution that would integrate into the building management system. 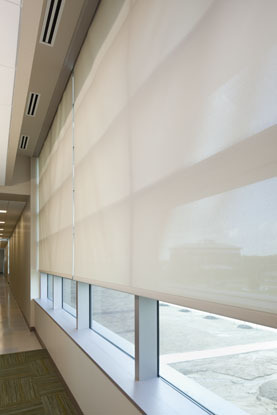 Working closely with Hunter Douglas Contract, the team selected motorized roller shades with automation and the capability for bidirectional intelligent control. 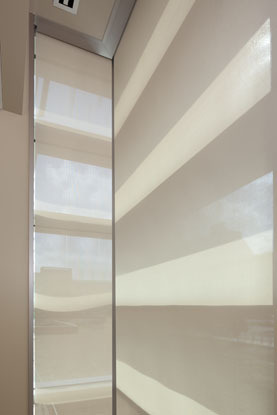 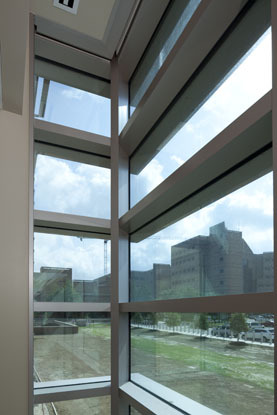 "When engaged, this new bidirectional, intelligent control technology allows individuals shades in an office to talk back to the central system when they are lowered or raised," said Hans Hodell, Hodell Window Coverings, the trade sub-contractor that sold and installed the motorized roller shades. 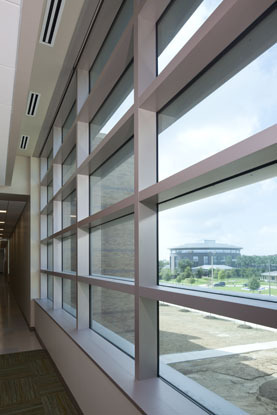 "The ability for the system to have real-time status of every motorized shade in the building provides an additional layer of control." 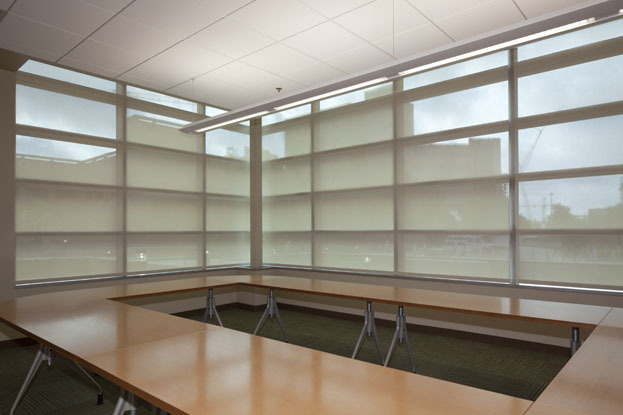 On each of the three floors, approximately 55 motorized roller shades are controlled by a main operating system that also manages other building functions, such as heating and air conditioning. 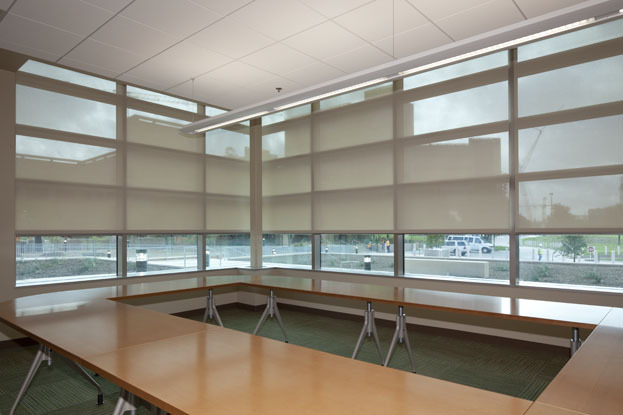 Although the system can be controlled at a central location, the BHT Center also has private offices that can be independently controlled to lower and raise individual office shades. 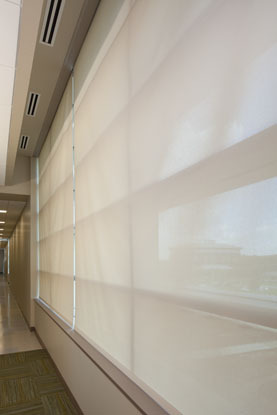 Each motorized roller shade features GlacierScreen HD1005 fabric, which is antimicrobial, VOC free, and OEKO-TEX 100 Certified. 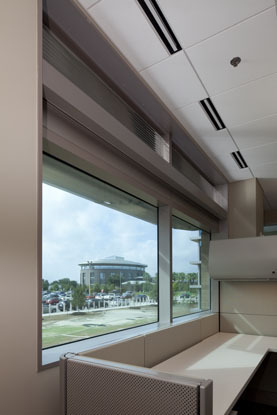 Hunter Douglas provided custom colors on the ceiling and surface pockets to integrate the shading solution with the facility's existing concept and maintain a uniform aesthetic. 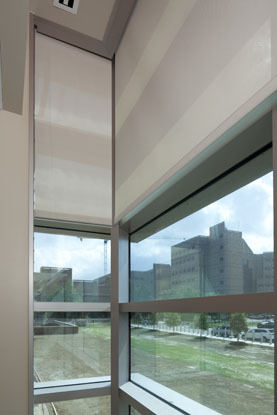 The ceiling pocket allows the product to be completely hidden when recessed. 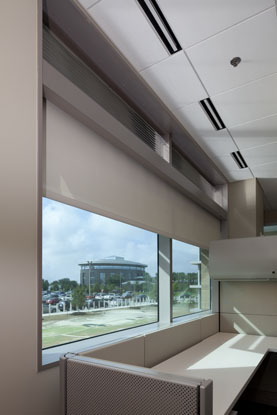 "The motorized roller shade system and high-performance fabric manage light passing into the space without hindering outward visibility, maximize energy efficiency, and contribute to the facility's sustainable features," said Christopher Hagen, Hunter Douglas Contract regional sales manager.